Here's why I liked Mirror Mirror. Into a marketplace that is trying to squash traditional fairytales with the trappings of fantasy action movies and flat, adapted monomythic storytelling, here was a film that aspired to be more comedic, in the tradition of The Princess Bride and Shrek, with middling success. Of course, it wasn't anywhere near as good, or as sharp as those films, but I really didn't understand the venom that greeted its release back in March. But that's why we can't have nice things, because three months down the line, here comes Snow White and the Huntsman. Apparently the first of a planned trilogy, the film begins with the beautiful and deadly Queen Ravenna imprisoning young Snow White, destined to be the fairest of them all, in order to protect her own kingdom-toppling reign. After a daring escape, a widowed huntsman is dispatched to slaughter her. Instead, he becomes her mentor and protector, as she sows the seeds of rebellion in the oppressed kingdom. I was disappointed, but not surprised, to hear that this involved Joe Roth, the producer who oversaw Tim Burton's unimaginative conversion of Alice in Wonderland into a flat, adapted monomyth, to the tune of a billion dollars at the global box office. In fairness to this film, it's pleasing to see that Universal still isn't making live-action movies in 3D, or worse, post-converting them, but with the intended franchise start-up, it's not cynical to say that there is more of economy than of imagination, in this telling of the tale. 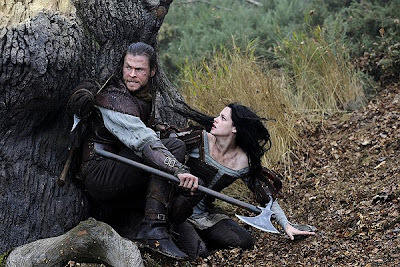 It might, however, be cynical to point out that by exploring the previously neglected character of the huntsman tasked with killing Snow White, here played by Chris Hemsworth, the film is looking for a way to shoe-horn a male lead character into a female-led story. If that were the case, I'm sure the huntsman would have more to do in the finished product, than simply inhabit one half of the title. Add a dodgy accent to that, and you wonder if the sometimes God of Thunder should demand a bit more to do if the planned sequel happens. Happily, the film does manage to focus on the rivalry between its female nemeses instead, if there was ever a larger role for the blokes in the heavily rewritten script, and Charlize Theron steals the whole movie as the formidable Ravenna. Following Mavis Gary in Young Adult, Theron's been doing a good line in bitchy women who are powerfully insecure about their looks, even if Ravenna's ability to leech beauty from young women is somehow actually less ghoulish than Mavis' intensive routines. Her bellowed rage against absolutely everyone veers between the absurd and the sublime in a way that's more entertaining than virtually everything else in this movie. Kristen Stewart should, by this point, know better. It's getting to the point where she's been in more franchise movies than the more interesting independent roles that I wish she would prioritise. She's good in this movie, but she's not given a very good script to fully realise that. However, Snow White has a power to inspire people that is woven into the story nicely, and Stewart's performance elevates the deficiencies in the script enough to show why she, more than her male co-stars, could feasibly continue to be a big star once Breaking Dawn Part 2 has finally been and gone. When the traditional quota of seven dwarves shows up, filled out by a surprising array of terrific British character actors like Bob Hoskins and Eddie Marsan, there's a particular emotional beat that feels entirely superfluous and pointless. The special effects are pretty, but CGI trolls, and unearthly soldiers made out of obsidian bits have next to no practical function in the grand scheme of things. For all of its attempts to be as serious as The Lord of the Rings, the film feels quite plush and soft with padding, especially in the case of the utterly lifeless love triangle between our leads and Sam Claflin's wet Prince William character. I hate to say I was right to dread this one, but Snow White and the Huntsman has too many unfortunate visual and narrative parallels with recent sub-par “re-imaginings” like Alice in Wonderland and Robin Hood. I wasn't completely right, in any case, because I actually quite liked the more serious spins on Snow White and the evil Queen, and particularly the performances by Stewart and Theron. But ultimately, it's far too long, adhering too closely to a marketplace check-list, and none of the rare attempts at levity are all that fun to watch. The overall effect is far more dreary than it actually could have been, and I really can't see where else there is to go, with parts two and three. 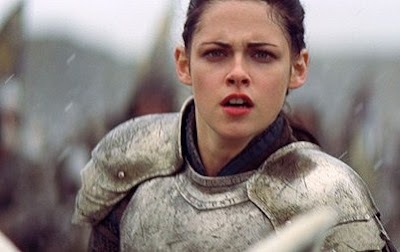 Snow White and the Huntsman is now showing in cinemas nationwide. If you've seen Snow White and the Huntsman, why not share your comments below? It's not been the best week for Charlize Theron, has it? Good review Mark. It was stylized in a more dark and gritty way, than we usually see from fairy-tale movies, but I still liked that about it even when the story started to get weaker. Also, just couldn't take my eyes off of Theron.